Is Your Backyard Damaging Your Home? Is your backyard or landscaping damaging your home? Here are some common things to look for! We are regularly called out to inspect Moisture Intrusion, Mold, and Structural Damage issues in homes. Often what we find is that they are a direct result of the land around them and proper landscaping is necessary to resolve the problem. This month, we would like to share the most common things that we see, and how you can resolve them! When it rains, this water collects on the ground and runs downhill. Ideally, this will direct the water away from your house, but if your home is downhill, the Water will likely come in through the foundation. There are a couple of options for addressing this issue. If possible, a landscaper may be able to regrade your yard so that this water is directed away from your house. If this is not possible however, installing drainage in your yard may be required. There are several drainage options available depending on your needs and a qualified landscaper should be able to make recommendations as to which option best suits your situation. Although trees are generally a desirable feature, if they are too close to the house they can cause serious issues. While most people recognize the potential damage roots can cause to foundations, that isn't the only concern. Large trees (especially pine trees) that are close to your home can prevent sunlight from reaching the roof and siding. Over time, this can encourage moss or mold growth and even rot! In addition, if the trees actually come in contact with the house, they can provide a means for infestation, and could even result in serious structural damage. Trees that lose leaves and / or branches can quickly clog gutters, which can lead to Moisture Issues and even Ice Dams! Unfortunately, in the case of trees that are too close to your house, there are really only two options. When feasible, you may be able to have the trees cut back or trimmed to reduce the chance that they may cause damage to your home. If trimming is not possible, or is unable to resolve the issue however, the tree may need to be cut down. A qualified landscaper or arborist should be able to assist you in determining the options available to you. Shrubs and ornamental plants are an incredibly important part of landscaping that can greatly improve the curb appeal of a property. When planted too close to the house however, they can trap moisture, encourage erosion, and harbor insects and other pests. When planning your landscaping, be sure to allow plenty of space between your house and where you expect the backside of the plant to be when mature. This will allow air movement to circulate around the plant and for sunlight to distribute evenly as well, which will prevent moisture issues that could result in mold growth or structural damage. The general rule of thumb is to allow between 22 inches and 3 feet between bushes or hedges and your home, being sure to plant in front of the drip edge of your roof. 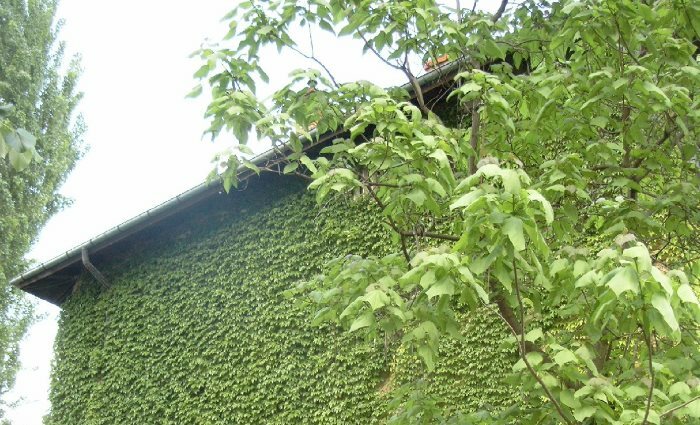 Many people love the rustic, almost "old world" look of Ivy growing up the side of their home, but this can create a tremendous amount of damage over time. As Ivy and other vines grow, they are able to root into the smallest of cracks and crevices in your exterior and can cause these surfaces to erode. Long term, this can allow Moisture Intrusion and even destabilize the exterior wall! It's important to check the condition of your exterior regularly, looking for any damage that may be new or worsened… If you find an area where vines are rooting into your exterior, it's best to remove them as quickly as possible. If you like this look however, there may be options available to you! Structures such as trellises allow you to have the best of both worlds without risking damage to your home. While mold contamination and structural damage that results from these issues will also need to be addressed by a professional, it is always recommended to resolve the cause as part of these projects. As many homeowners may not realize that their landscaping or yard could be contributing to the damage that they're seeing in their home, we always try to alert them to issues such as these that we do see. *This story originally appeared in the April 2017 issue of Connections Magazine, as part of a monthly contribution made by Disaster Blaster, Inc. Please check out the current issue of Connections Magazine for this month's story!